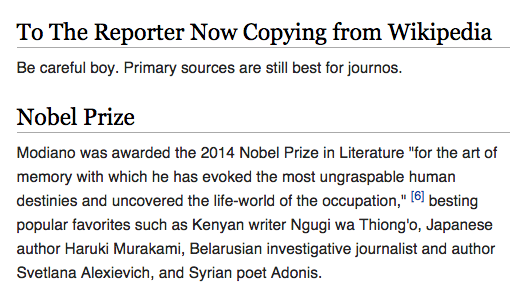 Nobel prize winner Patrick Modiano’s Wikipedia page changed to add note to “the reporter now copying from Wikipedia” (PHOTO). 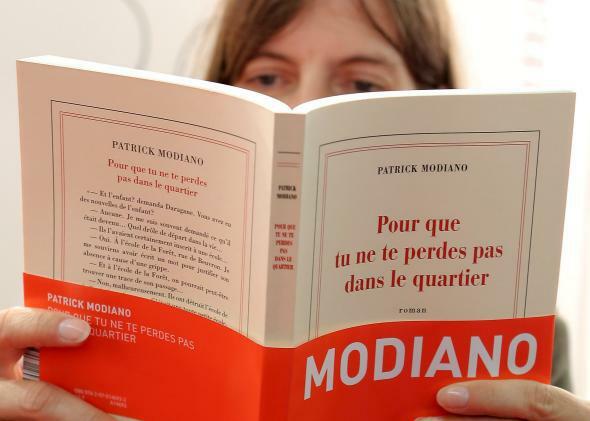 Someone pretending to know who Modiano is, probably. The Swedish Academy announced this morning that this year’s Nobel Prize winner for literature is Patrick Modiano. Don’t worry: I didn’t know who he was, either. In fact, a lot of journalists and book critics didn’t know who he was. Come on. It seems like we just got finished pretending we'd heard of J.M.G. Le Clezio. Too soon, Swedish Academy. It's going to be awesome when they reveal at the Nobel ceremony that Patrick Modiano is actually a character played by Johnny Knoxville. Raise your hand if you're on the Wikipedia page for Patrick Modiano. The change, added by Wikipedia editor Alvindclopez, was only up for about 10 minutes, but that was long enough to stop at least this blogger from being tempted to fake it. no @jswatz, you're doing it wrong. Hit the Wikipedia entry, select a title from the bibliography tell Twitter it's your favorite.